Underground Energy performed a detailed feasibility study of Aquifer Thermal Energy Storage (ATES) for 760,000 sf planned expansion of the VA Medical Center in Chillicothe, Ohio. 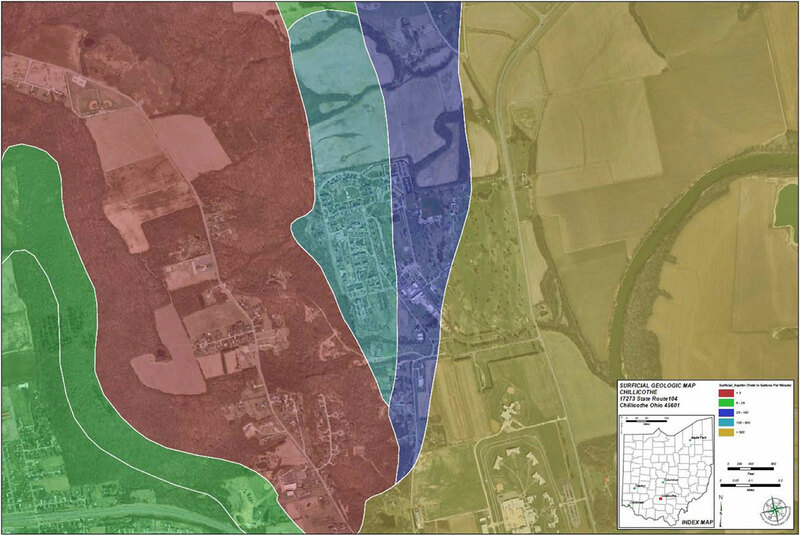 The project began with GIS analysis that identified a high-yield aquifer beneath a portion of the campus. The aquifer that lies beneath the golf course at the VA facility in Chillicothe is part of the Teays River aquifer system that extends through Ohio into Indiana and Illinois. Phase I of this project was a desktop feasibility study that evaluated a 450-ton ATES system for cooling only, because the VA has a biomass and gas steam district energy system for heating. After considering three implementation options involving a new chilled water loop, we concluded that ATES cooling would result in a 70% reduction in electricity for cooling, and recommended that site-specific aquifer hydraulic and geochemical data be collected. Underground Energy helped VA staff develop a hydrogeologic work plan, and we also performed the analysis of the data collected by a separate contractor. The field work involved installation of observation wells, pumping wells, performance of aquifer pumping tests, and geochemical sampling. The second phase of the ATES feasibility study considered two cooling-only options with a new chilled water distribution loop and an option to include heat pumps and ATES heating in a planned renovation of one of the hospital buildings. ATES cooling options were conservatively compared to a new, efficient chiller plant rather than existing systems. A 5-well, 880 gpm well system conceptual ATES design was developed. The cold store supplies chilled water for cooling from 40 to 48 °F as the cooling season progresses. The cooling & heating option utilized a gas-engine-driven heat pump to transfer heat between the building and the aquifer stores. Heat from the HP is distributed via a closed hot water system and also used for make-up water preheat in the boiler plant and space heating and domestic hot water within Building 31. This gas engine configuration also meets the definition of Combined Heat & Power (CHP) because heat from the engine is recovered while mechanical energy is used to drive a heat pump, rather than an electrical generator in a typical North American CHP installation. The ATES system conceptual design included the district cooling infrastructure to complement the heating capacity of the existing biomass CHP system.